Last month I was suddenly hit by a strong sense of nostalgia. In general, my thoughts seem to be more directed towards the future than the past; we are such pioneers in Buddhism and I often feel as if our main job is to develop a practice model for the next generation. But, of course, the month of December lends itself quite naturally to reflecting on the days gone by. And, in my case, getting older may have something to do with it too: there is just more and more to look back on. Looking back is something that seems to happen to most of us quite often during zazen. Memories can come up any time, both happy and unhappy ones. In fact, one of the functions of zazen is to digest those memories – if necessary, over and over again – so that we at some point can swing our arms more freely, without being burdened by the past. So many people, particularly of my age, look as if they are carrying a very heavy load: memories collected during a long life, or perhaps over the course of many lives. Many of the things that happen to us are not being processed properly. Torn between likes and dislikes it is hard to really swallow whatever we experience and digest it thoroughly. And we get stuck with hard bits that can come up any time. We encounter a difficult situation or get into an argument with someone, and suddenly an old memory flares up, completely dictating our response. In zazen, we allow space for whatever is – and this gives us a clearer perspective on how to deal with things more creatively. According to the 12th Century Chinese Master Hongzhi: in this state of silent sitting, the mind clearly perceives the details of sensory objects; yet as though transparent, no constructed image is produced. * This means that the load with which we feel burdened is constructed, something cooked up in our mind, and it is very conceptual. In truth, there is nothing that has any everlasting substance; by nature, everything is transparent. But, because of attachment and aversion we make things heavy and opaque. Of course, whatever we like is hard to let go of. Yet when we resist certain things, we would like them to disappear. And then it is tempting to think that they will just dissolve during zazen and be gone forever. But that’s not true. Things that happened have happened. But it is possible to see through them and, as Master Hongzhi says, they can become transparent. Life’s events are clearly perceived but they just don’t bother us so much anymore – they have been lit up and we have been made lighter in the process. In my December nostalgia, a lot of images came up of paintings I love. They happen to be part of my personal history and appeared like a slide-show of memories. And I realised once again that all good paintings have a transparent quality. However thickly the paint is applied, the end result is a combination of fields that we can not only look at but also look through. And at the same time, all parts of the artwork seem to emit light that shines towards us. This is something I have learnt to see as a hallmark of quality. In zazen, our life itself is the artwork we are creating. Can I really let the light come through? 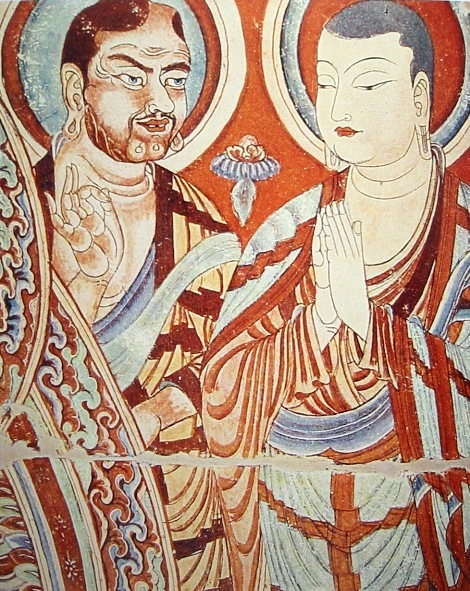 The two characters on a ninth-century fresco from the Bezeklik Thousand Buddha Caves near Turfan, Xinjiang, China (a Caucasian Central Asian monk together with one from East Asia) seem to point us the way. As I read this, it made me think again about the amount of exposure that happens during zazen, where with a keen eye, that which was hidden becomes visible. Some may have a past which is haunting, or some may even have a past which is motivating. Yet in both cases there can be a constructed image of a person or identity which the observer may want to hold onto. Maybe “seeing through it” in any case provides an opportunity to be constantly made anew. Like an old and withered Classical painting found in a dusty attic, but still has the potential to be restored. Thank you for your nostalgia!